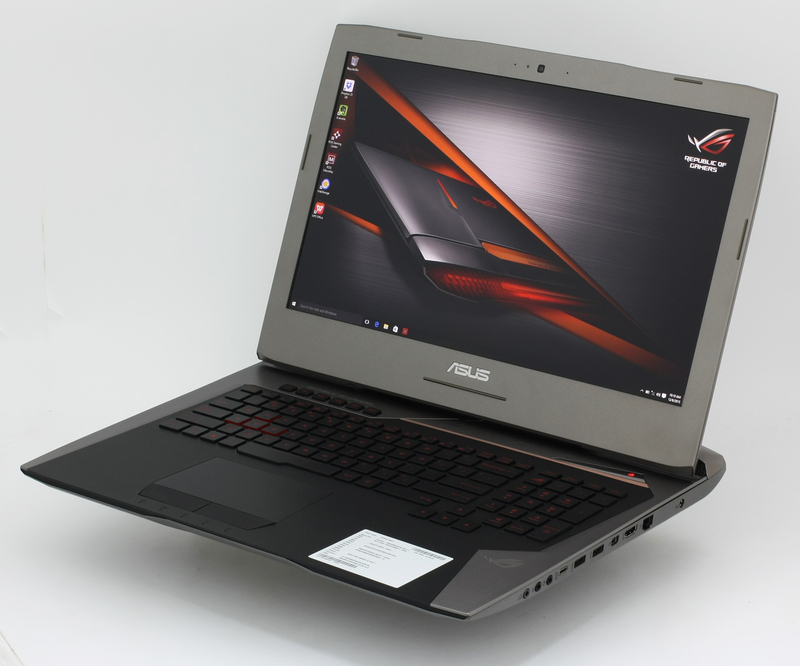 ASUS’ ROG series has been killing on the gaming notebook market segment but in the last couple of years, more and more alternatives start to pop out beside the hard time the Taiwanese company gets from Alienware. This year even Acer released its premium Predator offering in the high-end gaming class so it will be quite interesting to see if the new ROG G752 has what it takes to take on the competition. Of course, the new ROG flagship doesn’t fall behind its competitors in terms of performance since it delivers a choice between Core i7-6700HQ and the overclockable Core i7-6820HK while, on the GPU front, there are configurations with GeForce GTX 965M, 970M, and 980M. However, we are very pleased to see another M.2 PCIe SSD slot in addition to the old one. And, of course, the additional RAM slots that allow up to 64GB of DDR4-2133 RAM. Last, but not least, the chassis has also been revamped yet keeping the old concept. The teardown revealed almost identical cooling system design and construction. That’s not necessarily bad, especially when considering the fact that the old ROG G751 did perfectly in our temperature tests. So what’s new and what’s old? You can look for the ASUS ROG G752 over at Amazon.com. We are not sure what ASUS has in stored for us this time because the unit we used for reviewing was a testing sample and the full retail package wasn’t at hand. In terms of design and overall appearance, we can say it’s a big leap forward. 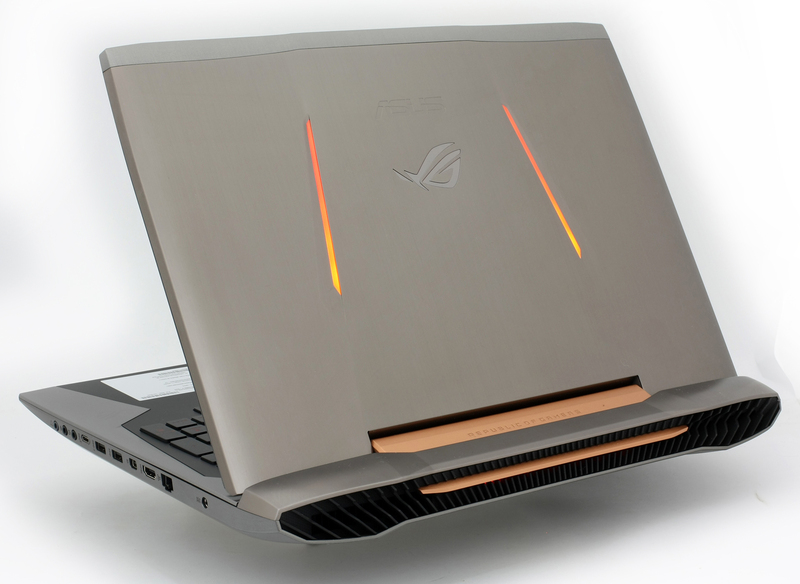 It’s not the usual ROG design and it’s quite refreshing to see a different choice of color palettes and appearance. 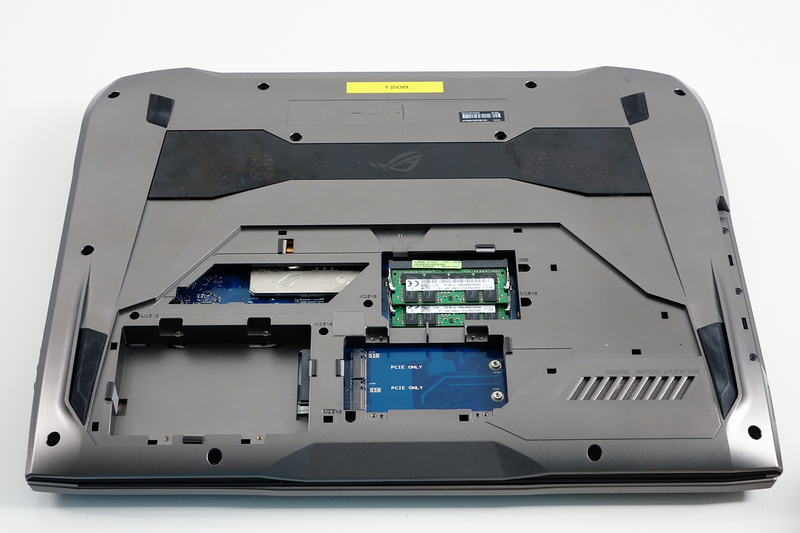 However, the rigidity of the chassis and choice of materials doesn’t seem to be better than last year’s ROG G751. 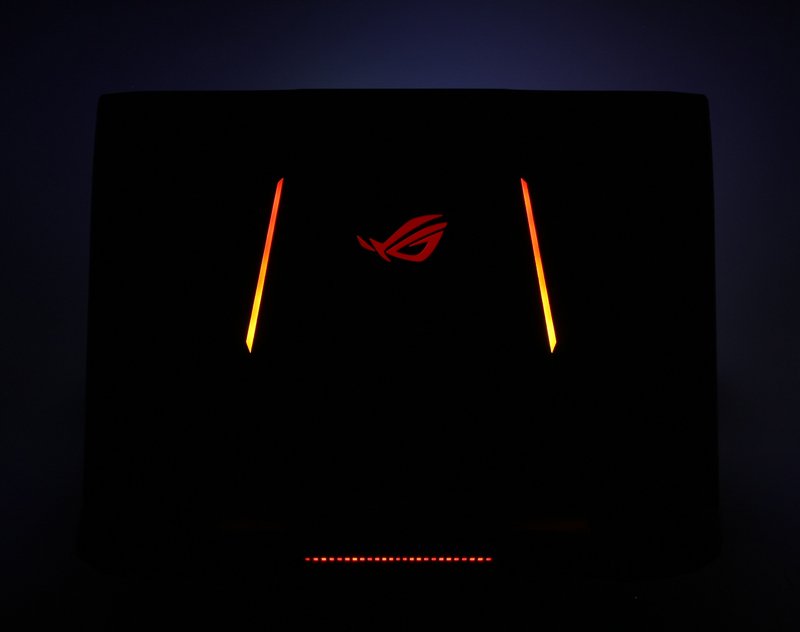 For starters, the lid is now fully covered in aluminum with ASUS’ backlit ROG logo in the middle and two orange LED stripes on each side. The plate bends a little under pressure but no matter how much pressure we applied to the lid, there were no ripples on the LCD screen on the other side. The hinges are okay and the lid lifts up easily without using both hands. There’s also a small plastic bezel on the top of the lid and that’s where the Wi-Fi antennas reside, for better reception, of course. In contrary to the top cover, the bottom piece is entirely made of plastic that imitates aluminum. You can easily distinguish the opening for the subwoofer, two grills on the service cover, which is detachable and gives access to two of the RAM slots, 2.5-inch drive, and the two M.2 PCIe SSD slots. In addition to all those things, there’s a neat transparent plastic cover that lets you peek into the internals, but you will mostly see a part of the heat pipes and two fans. It’s cool, but it’s on the bottom so you will not see it most of the time. 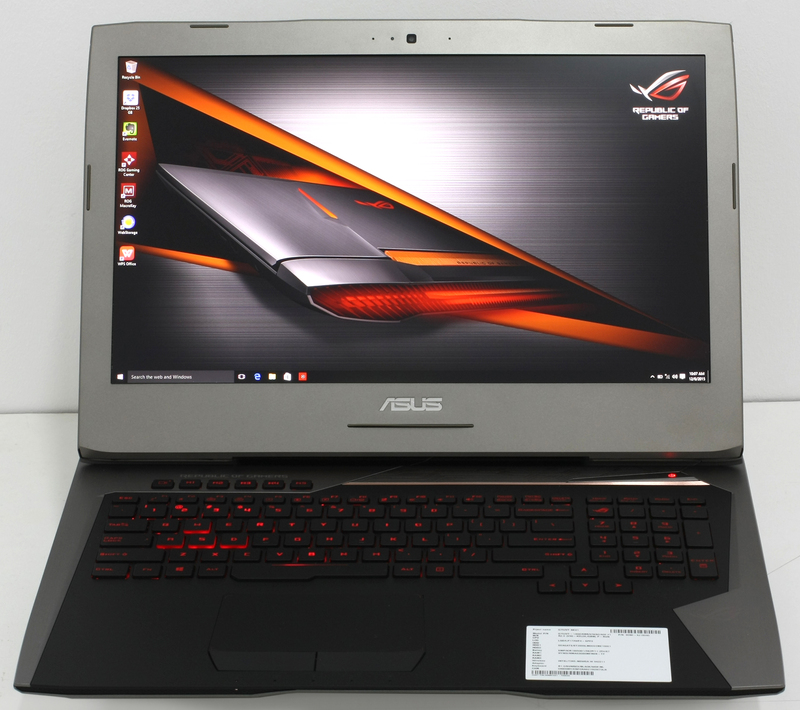 This time around, ASUS was able to trim down the profile of the machine by a fair margin. 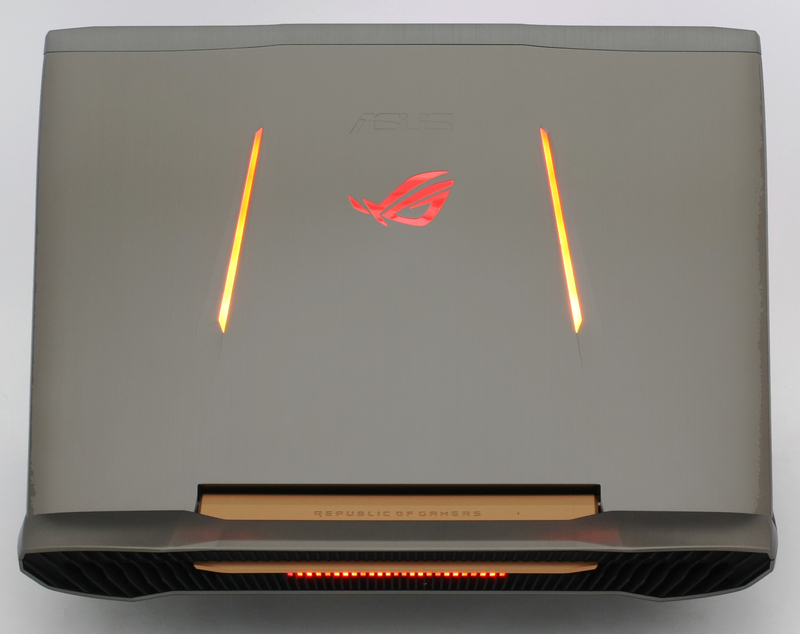 The new ROG G752 now has 48.26 mm thin profile from 53.00 mm height. 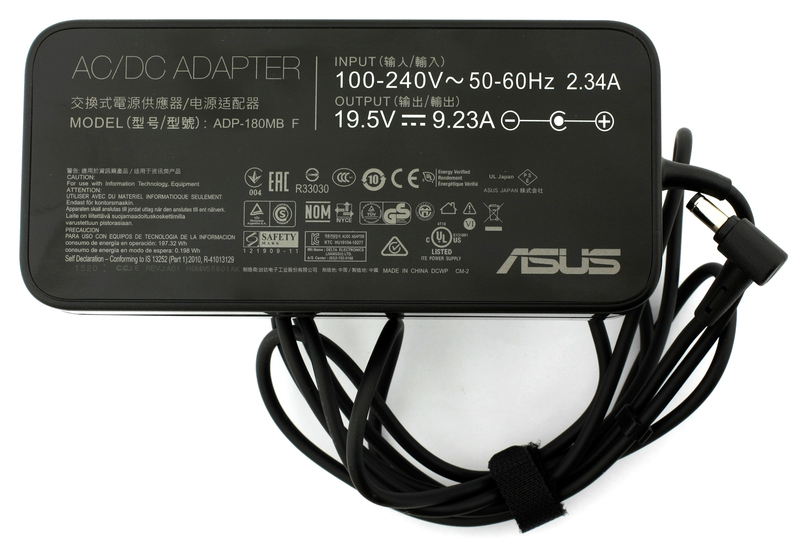 Nevertheless, ASUS’ port placement isn’t that good this time – we’ve got almost all ports crammed in the right side where the cables might obstruct normal mouse usage. We’ve got the LAN, HDMI, mini DisplayPort, two USB 3.0, USB 3.1 (Type-C) and three 3.5 mm audio jacks for microphone, headphones etc. There’s also the DC charging port while the left side only has the optical drive, SD card reader, and two USB 3.0 ports. The back side of the machine features the iconic exhaust vents. This year’s version has vents that look more like an exotic sports car and have cool red LED light in the middle. There’s also that plastic gold-colored plastic piece between the hinges. In contrary to the overall change in the design, the interior somehow doesn’t go too far from last year’s G751. It has the same matte, soft-touch finish around the keyboard and touchpad, but there are a few aluminum-like elements around the edges. The design of the power button also seems pretty cool, blends perfectly into with the design signature. Unfortunately, though, these elements are plastic imitating brushed-aluminum. The real thing would have been better, especially with last year’s version. The teardown also revealed that the G751 had slightly better choice of materials and felt sturdier than today’s variant. The keyboard has also been changed, but for the better. Two more macro keys are added and now they don’t interfere with the keyboard – they are spaced apart and they are easily distinguished. But the overall feel of the buttons hasn’t got any major changes – the keys still offer long key travel (same as before 2.5 mm), they are well separated from each other, the WASD and arrow keys are highlighted, easy to find and the LED keyboard offers three levels of brightness as well as supporting rollover up to 30 keys. 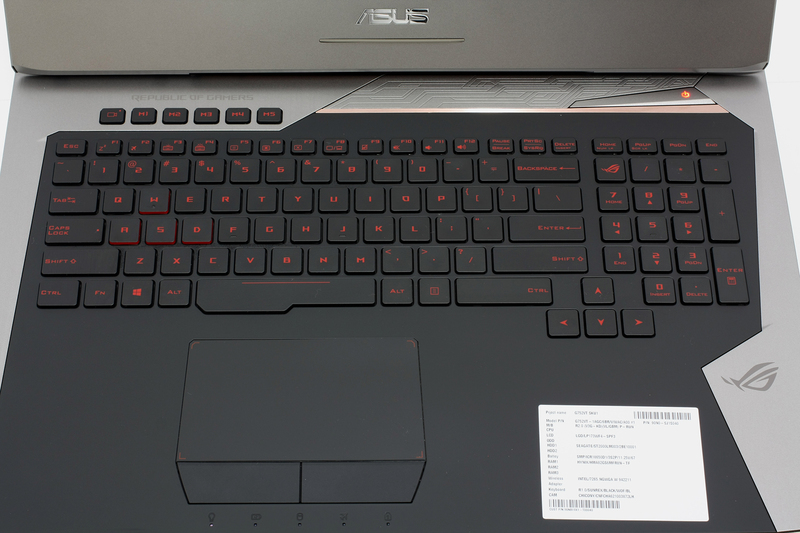 We are also pretty disappointed that the engineers at ASUS still haven’t included the media player buttons into the keyboard and the volume keys are still too far from the “Fn” key so lowering or increasing the volume has to be done with both hands. As for the touchpad, it’s quite comfortable – no significant changes here – the mouse buttons are the same and so is the surface of the trackpad. We are left with mixed feelings about the new G752’s overhaul. While it gives a breath of fresh air to the old ROG flagship series with totally different design and choice of colors, it doesn’t meet our expectation in terms of rigidity. Only the lid is made of aluminum and the keyboard tray sinks when little pressure is applied. At least, this doesn’t affect the performance of the keyboard. It’s hard not to mention that the machine now weighs more than its predecessor while incorporating more lightweight plastic – 4.31 kg for the new G752 and 4.05 kg for last year’s G751. Moreover, ASUS haven’t changed the placement of the ports that may get in the way for some of users. Just like its predecessor, the G752 offers a fair amount of upgrade options. You can take advantage of the 2.5-inch HDD/SSD slot, which is occupied by the stock HDD most of the time, 4x RAM slots supporting up to 64GB of DDR4-2133 RAM and two M.2 PCIe NVMe SSD slots support 2280 standard with M-edge key connectors. You can check out our article regarding the full disassembly of the machine and a bit more about the build. The notebook comes with Full HD AH-IPS panel manufactured by LG Display with model number LP173WF4-SPF3. 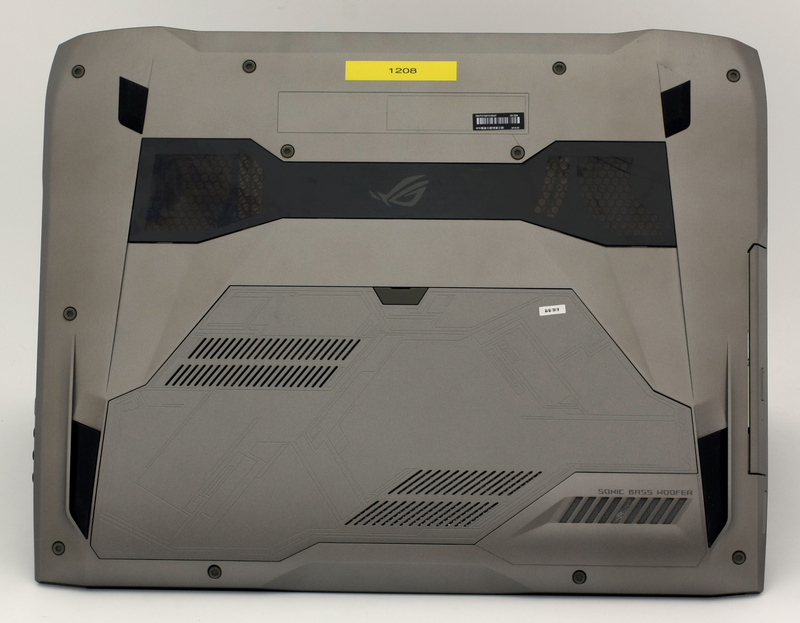 Most probably, this is a revised third version of the panel that we found in the old G751JY with G-Sync. And, of course, this one packs the G-Synch chip as well. Moving on – the panel measures at 17.3 inches with 1920 x 1080 resolution, 16:9 aspect ratio, 127 PPI and 0.199 x 0.199 mm pixel pitch. It can be considered as retina if viewed from a distance equal or greater than 69 cm. Since this is an IPS panel, the display offers excellent viewing angles from a 45-degree angle. We were able to detect 334 cd/m2 maximum screen brightness with only 12% deviation. Both results are excellent and the display will perform well even under bright light source. The color temperature on white screen is 7250K – a bit cooler than the optimal 6500K but still okay. Also, there’s a small deviation on the upper-right of the screen. ASUS has included a so-called ASUS Splendid Technology for easy setup of the display. There are several presets for you to take advantage of, for different purposes, of course, but we used “Normal” for our tests. Although the panel doesn’t have perfect sRGB coverage, we consider the result still pretty good – 90% of the sRGB color gamut is covered. This will ensure relatively accurate color reproduction and vivid colors. The graph below is the same but with recorded results and the colored circles represent the reference colors, the white circles being the result. You can see the main and additional colors with 100% and 50% saturation inside the sRGB gamut. The gamma curve aligns perfectly with the optimal 2.2 after calibration. We tuned the display at 140 cd/m2 and 6500K color temperature. We used X-Rite i1Display Pro for calibration. We tested the display using 24 commonly used sample colors like skin tones, grass, blue sky, orange etc. After profiling, the display had an average DeltaE 2000 deviation of only 0.69, while the contrast was 1030:1 before and 870:1 after calibration. Excellent results. Here’s another batch of colors that we’ve tested. Great news here. Since the panel is actually an updated version of the old one, the display doesn’t use PWM for adjusting brightness and the G-Sync enabled displays we’ve tested so far lack the so-called screen flickering effect. Once again the panel used for the flagship ASUS ROG series doesn’t disappoint. While it’s far from the sRGB color gamut coverage (90%) that the Acer Predator offers (100%), the G752 holds several key advantages over its competitors. For starters, the G752’s display has integrated G-Sync chip allowing smooth gameplay on-the-go instead of relying on an external monitor support like the Predator. Also, the refresh rate of the panel is 75 Hz and that’s a considerable perk for gamers. 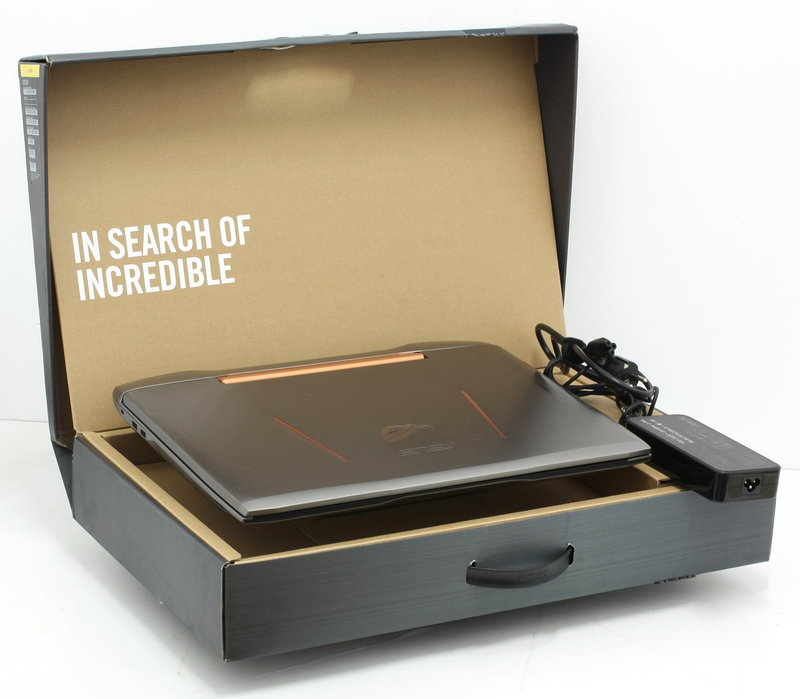 And it’s also a better choice compared to the 15-inch Dell Alienware, which didn’t do very well in our tests. Anyway, back to the G752. It still lacks the PWM across all brightness levels (harmless to one’s eyes), has high contrast ratio, fairly accurate color reproduction, and high maximum brightness. It’s not perfect, but it will do an excellent job for gaming, multimedia etc. Again ASUS has included a subwoofer at the bottom to aid the main loudspeakers and make the multimedia experience fuller. Our tests confirm the initial thoughts we had about the sound system. The sound is crisp and full in low and mid frequencies and there’s little distortion in the high frequencies. There’s also a software that can make the multimedia experience more optimized depending on the genre of music or activity. 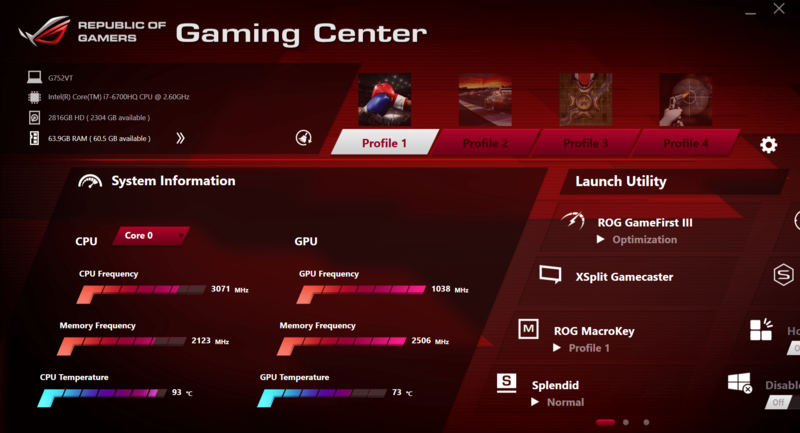 The notebook also comes with pre-installed so-called ROG Gaming Center that gives you geeky stats like CPU and GPU frequencies, temperatures, and memory status. You can also customize different profiles depending on the game you currently play with preset profiles of the macro keys as well. Unfortunately, the new unit has significantly lower battery capacity and this will affect the endurance of the machine for sure. Last year’s version features 8-cell 88Wh battery while the G752 incorporates only 6-cell 66Wh while packing roughly the same components. Only the motherboard and CPU are newer generation promising better power consumption, but we doubt this much capacity can be compensated. Moreover, we discovered that the notebook excludes the iGPU and thus the machine doesn’t have switchable graphics feature. This means that the discrete GPU will take care of all GPU-related tasks and consuming more energy in the process. We ran the usual test with the following settings: Wi-Fi turned on, power saver mode turned on and screen brightness set to 120 cd/m2. Disappointing but expected result due to the smaller battery capacity – 195 minutes (3 hours and 15 minutes). For every test of this kind, we use the same video in HD. Still falling behind its predecessor – 218 minutes (3 hours and 38 minutes). We doubt you will start a gaming session away from the charger but here’s how much time you will get out of the system – 95 minutes (1 hour and 35 minutes). Furthermore, the chip is manufactured using a 14nm FinFET process and integrates Intel HD Graphics 530 GPU with 24 EU (Executable Units) clocked at 350 – 1050 MHz. The memory controller supports up to 64GB of DDR3 or DDR4 RAM at 1600 or 2133 MHz respectively. The CPU is suitable for heavy applications and gaming. Fritz is a chess benchmark that tests the computing capabilities of the CPU with various chess moves. The Intel Core i7-6700HQ managed 12.456 million moves per second. By comparison, one of the most powerful PCs, Deep(er) Blue, was able to squeeze out 200 million moves per second. In 1997 Deep(er) Blue even beat the famous Garry Kasparov with 3.5 to 2.5. 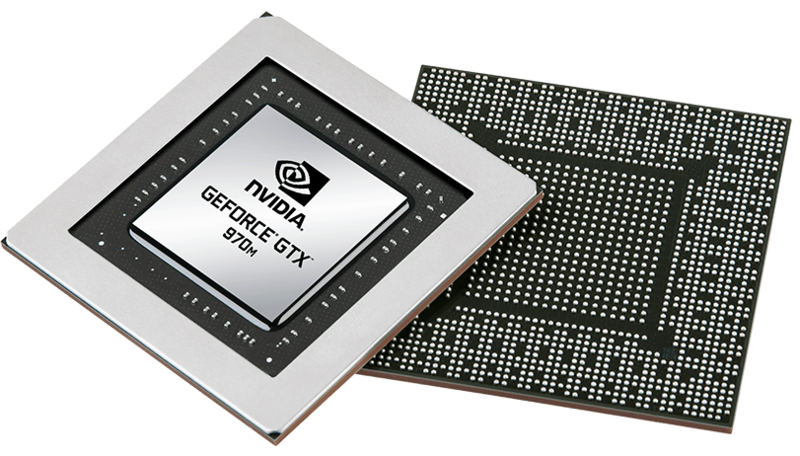 NVIDIA GeForce GTX 970M is a high-end graphics chip, announced on October 7, 2014. NVIDIA GeForce GTX 970M uses the Maxwell GM204 architecture and has 1280 CUDA cores. All of them operate at 924MHz, but NVIDIA’s GPU Boost 2.0 can dynamically increase that frequency. The graphics card has a 198-bit bus and supports DirectX 11.2, Pixel Shader 5.0, Optimus, SLI, PhysX, OpenCL 1.1, OpenGL 4.4, DirectCompute, CUDA, Blu-Ray 3D and 3D Vision. Memory bandwidth is 120GB/sec. Max resolutions (WxH) are 3840×2160 digital and 2048×1536 analog. All gaming tests were performed using NVIDIA’s latest drivers at the time of this review – 359.06 WHQL. The two-staged temperature test doesn’t translate into real-life usage since it’s quite unlikely that the general user would reach 100% CPU and GPU load, but we continue to do this test because it’s a good way to determine the overall stability of the machine under heavy load and how the cooling system handles higher temperatures. Before we started the CPU stress test, we recorded idle temperatures around 35-36 °C and after we started the test, the silicon reached around 90 °C for a brief time and then the fans cooled the chip down to 73-77 °C. We would like to note that there wasn’t any throttling and the machine ran pretty quietly without moving away from the 3.1 GHz mark – this is the maximum operating frequency for four active cores. 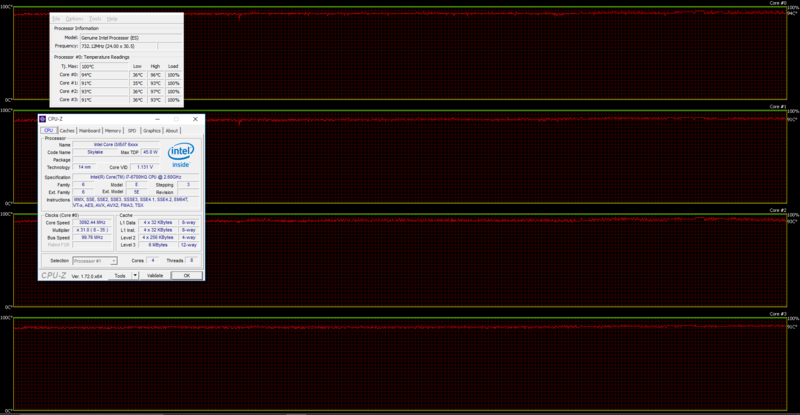 You can see the red and green line below representing the temperatures and CPU load, respectively. After an hour had passed, we switched on the GPU stress test as well. The silicon’s temperatures rose and reaching as high as 95-97 °C, but even then the chip maintained operating frequency between 3.0 GHz and 3.1 GHz while the GPU ran pretty cool as well – reaching a maximum of 74 °C without any throttling issues. We also measured the temperatures on the surface and again the G752, just like its predecessor, passed our test with flying colors. We are pleased with the results and the fact that engineers at ASUS have stuck with the same cooling system concept as before – by drawing hot air from the keyboard and out from the chassis. Exceptional cooling system as always. 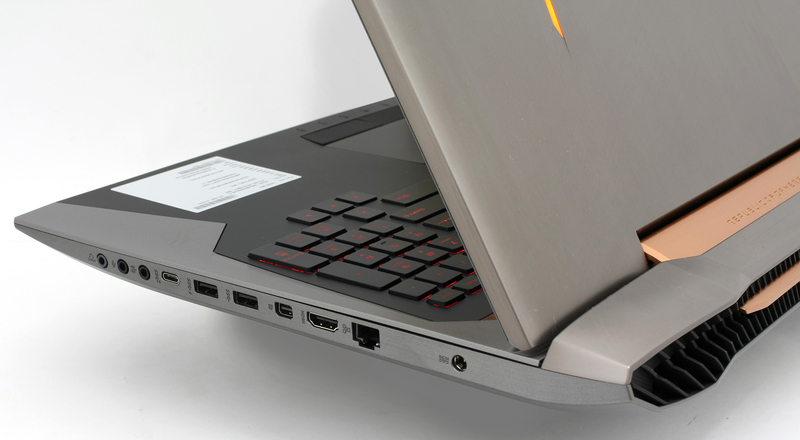 At the end of the day, the G752 remains one of the best gaming notebooks on the market but there are several key aspects that should be considered when compared to its direct competitors – Dell Alienware 17 and Acer Predator 17. It’s also more advanced than its G751 predecessor in terms of hardware but falls short when it comes to overall build and mobility. The teardown revealed roughly the same concept as before but with a different choice of materials that leads to less rigidity and solid feel. Some parts can be replaced with aluminum elements to elevate the feel and others need to be more solid, like the lid and keyboard tray for example. Also, the designers still incorporate most of the ports on the right side of the chassis making it a bit overcrowded. However, we are still happy with the input devices as both, the keyboard and touchpad, offer superb usability and user experience. Anyway, the notebook offers hardware that’s on par with the competition and it’s even a more practical solution compared to the Acer Predator, which has two different M.2 PCIe standards – one 2280 and one 22110 with different connectors. The G752 uses two 2280 M.2 PCIe NVMe SSD slots and yet doesn’t support RAID 0 configurations. On the contrary, the Predator and Alienware support RAID 0 storage setups. So if the latter is important for you, we suggest looking somewhere else. The cooling system once again proved to be effective and relatively silent and we suspect that the final unit, since we are using an engineering sample, will do even better. Either way, we didn’t observe any throttling or excessive heat thanks to the design of the cooling system, which draws hot air from the keyboard area. Nonetheless, the battery life is a big letdown compared to the last generation. The G751 had much bigger battery (8-cell 88Wh compared to the 6-cell 66Wh) and also the absence of iGPU (switchable graphics) in the G752 led to significant decrease in battery performance. 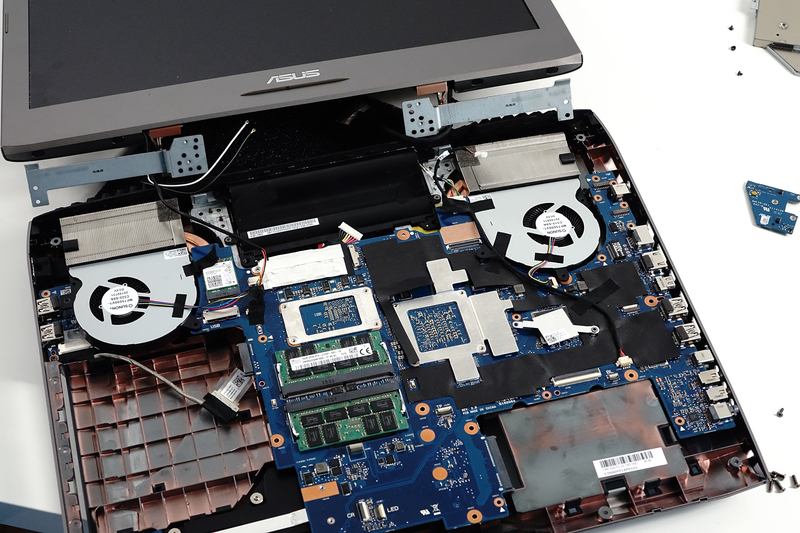 Finally, we would like to address the screen as this is probably one of the most important aspects in a gaming laptop. The G752 inherits roughly the same panel as before, but that’s not necessarily a bad thing. The screen features high maximum brightness, excellent contrast ratio, high sRGB color gamut coverage, 75 Hz refresh rate, good viewing angles and a G-Sync chip for smooth gameplay. The latter isn’t present in the Acer Predator so this might be a deal-breaker for some. Can you review the G752VY? That model has a larger battery, better GPU, and advanced cooling system which are not present for the model you tested. You are right, but not entirely. The cooling system is the same, but the battery is larger only in some configurations and it’s still not clear which. The cooling system isn’t the same. The G752VY uses vampor chamber cooling while the G752VT does not and all G752VYs have a 8-cell 88Wh battery. Mhh not exactly, G752 “Vy” has a Vapor Chamber Cooling System and rear exhaust fans, they are all in orange color. Can you tell what settings did you use for screen calibration? With a BIOS upgrade, both VT and VY models DO support RAID 0! Is the graphics chip upgradable?